The Nigeria Police Force (NPF) on Thursday presented cheques of N29,836,378 million to 51 families of police officers who lost their lives in the line of duty. 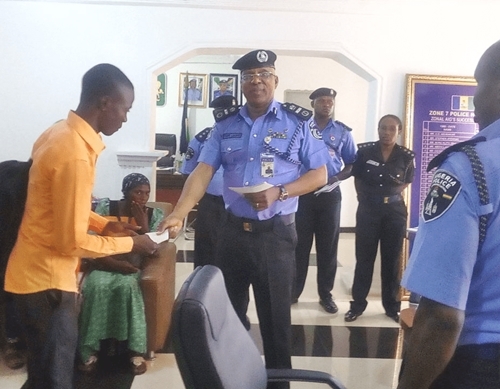 Taiwo Lakanu, the Assistant Inspector-General (AIG) of police in charge of Zone 7, Abuja, who presented cheque leaves to the beneficiaries in Abuja, said it was the duty of the force to take care of officers and their families. The police boss said commissioners of police in the state under the zone would present the remaining cheque to other beneficiaries. The News Agency of Nigeria (NAN) reports that beneficiaries cut across the FCT, Niger and Kaduna State which make up the Zone. He added that the late officers paid the supreme price to curtail crimes and criminality in the country. Mr Lakanu said the IGP, Ibrahim Idris, had restated his commitment to ensure that what accrued to the families of the deceased officers was given to them. He pointed out that apart from the group life insurance for officers, he had taken it upon himself to create special welfare fund known as IGP Welfare Fund to boost the package. He noted that “the essence of this gesture is not the money really but the idea behind it to let you know that you are not forgotten. He said that the force was committed to the welfare of families of officers who sacrificed their lives for the peace of the country. He condoled with the beneficiaries and assured them of continued support of the force. Responding on behalf of the beneficiaries, Andrew Moses appealed to the force to continue to support the families. He commended the IGP “for the fatherly care” and urged him not to relent in efforts to support families of late officers.